Aung San Suu Kyi delivering her Nobel Lecture in the Oslo City Hall, 16 June, 2012. 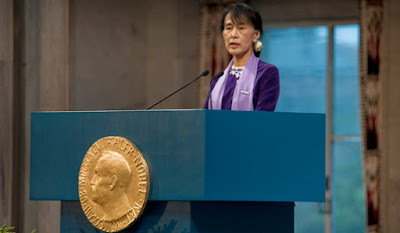 It is time for the Nobel Foundation to strip Aung San Suu Kyi of the Peace Prize it awarded her in 1991. In her failure to speak up against the atrocities now being committed against the Rohingya and other minorities in her country, Suu Kyi has not lived up to the spirit of that award. For weeks now, reports of the merciless prosecution of the Rohingya and fellow ethnic minorities have been emerging from Myanmar. According to Amnesty International and other rights groups, the ethnic Rohingya continue to suffer egregious rights violations under the country’s military regime. In the face of this, it’s very sad to see such a highly respected champion of democracy staying silent and behaving as if nothing is happening in her own backyard. Though the Myanmar army control the three most important ministries, which means Suu Kyi’s power as the country’s de facto leader is limited, she has a duty to exercise her moral authority and influence to stop the brutality being meted out to minorities by her military. The Nobel Peace prize has been awarded annually since 1901 to recognise “those who have done the most or the best work for fraternity between nations, for the abolition or reduction of standing armies and for the holding and promotion of peace congresses”. It is clear that Suu Kyi is now failing to meet that standard. Stripping her of the prestigious award would send a strong signal to the Myanmar government that the ongoing slaughter of the Rohingya and other minorities in their country can no longer be tolerated. It will also send a strong reminder to other awardees that they carry a heavy burden of responsibility to maintain their efforts to put an end to all forms of cruelty and uphold justice and peace.